The AnaSonde-3M is a multi-purpose variant of the AnaSonde-3 family. As compared to the AnaSonde-3E, one major change is an increase in the number of analog channels from two to seven. 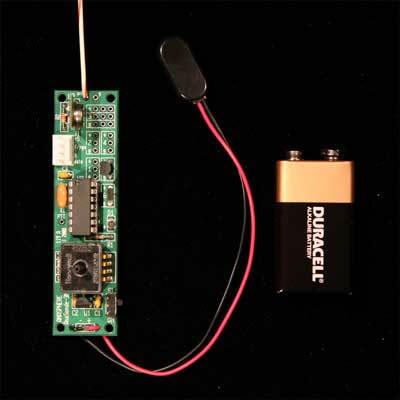 This radiosonde features seven 10-bit analog-to-digital converter channels with 0-5 volt DC inputs (referenced to the regulated 5 volt supply voltage) and one frequency-counting channel which measures frequencies up to 25 kHz with 1 Hz resolution. A 10 milliwatt CW transmitter at approximately 434 MHz transmits data at regular intervals. With pressure, temperature, and humidity sensors (as pictured on the right), it has a mass of 15.0 grams. The circuit board is 0.85 x 3.25 inches. There are two other major enhancements found in the AnaSonde-3M as compared to the AnaSonde-3E. First, the AnaSonde-3M is inherently capable of both Morse code and ASCII output - the output mode is selected by the user during configuration. Second, the AnaSonde-3M has a secondary configuration mode which makes it particularly easy to enter call signs as compared to the standard configuration mode (presuming one is manually entering the configuration without using the associated software).